Panzer IV H – German medium tank Panzerkampfwagen IV Ausf H.
German medium tank PzKpfw IV Ausf H.
PzKpfw IV Ausf H on manoeuvres in Normandy, 1944. Of the 3,935 Panzer IV Ausf H chassis produced, 3,774 were completed as PzKpfw IV, with 30 used for the first StuG IV assault guns and 130 for Brummbär. In November 1943, an attempt was made to alter the suspension to gain ground clearance. The experiment failed and the Panzer IV retained the same basic suspension from 1937 until the end of the war. The basic change from the Panzer IV Ausf G was the SSG77 transmission fitted to the Ausf H. The frontal armour on the Ausf H evolved from 50mm basic with 30mm additional, to 80mm basic, to 80mm basic interlocked with the hull sides. 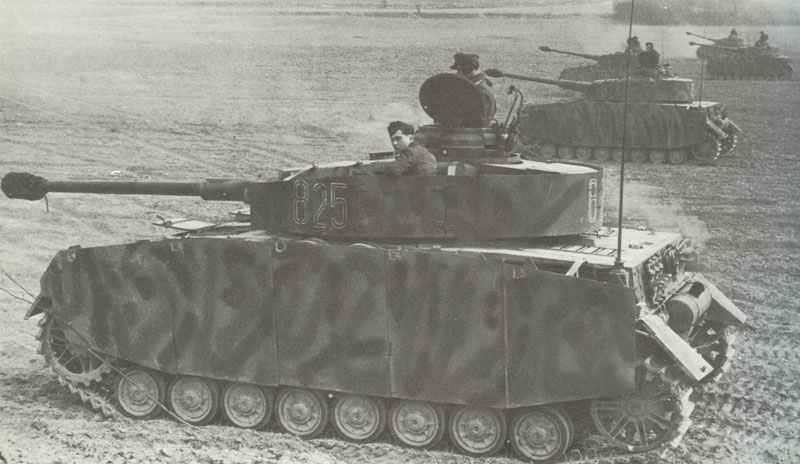 Minor modifications, introduced during the production run of the Ausf H, included external air-filters, all-steel return rollers, a cupola mount for an anti­aircraft machine gun, a new style idler, and the deletion of the side vision ports for the driver and radio operator. Panzer IV Ausf H with the long 7.5 cm gun and armour skirts. The backside of a PzKpfw IV H with additional Zimmerit coating against magnetic anti-tank mines. Disabled Panzer IV Ausf H, near Voronezh in Russia, 1943. The additional armour skirts at the hull were often lost in heat of battle, but the skirts at the turret were permanently mounted. From 1943, Panzer regiments in the Panzer divisions were to have one detachment equipped with Panzer IV and one detachment with Panthers. As a result of problems with the Panther , some Panzer divisions had a second detachment equipped with PzKpfw IV, while many had but a single detachment of four companies, each equipped with twenty-two PzKpfw IV, plus eight with the HO Company. On 6 June 1944, most of the 748 Panzer IV with the nine Panzer divisions in France were Ausf H.
Users: Germany, Bulgaria, Croatia, Finland, Italy, Spain, Rumania, Turkey, Hungary (for all variants). 1939 211 (1.9.) 141 ? 1940 280 (10.5.) 278 ? Tagged 1943, germany, medium tank, panzer 4.